Pope Francis has welcomed today in a private audience a delegation of Albania, headed by the Speaker of Parliament, Gramoz Ruçi, along with a representation of Albanian and Arbëresh religious beliefs on the occasion of the 0th anniversary of the death of our national hero, Gjergj Kastrioti Skanderbeg. 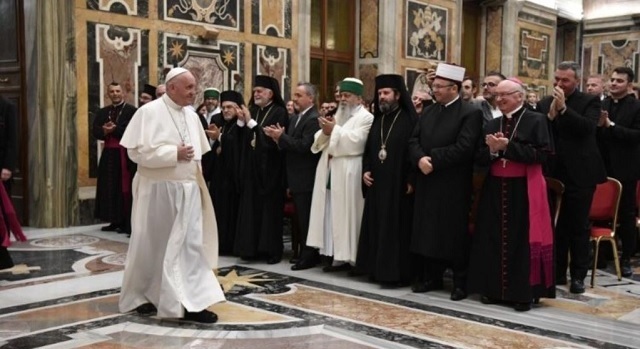 "Albania is an integral part of Europe and through its noblest traditions, documents the origins of its civilization," said the Holy Father during this meeting. "However, this country requires a real and balanced development so that younger generations are not forced to choose the path of immigration, leading to the weakening of the country's strengths that are essential to its human and civil development," said Pope Francis. "The ancient connection of friendship and relations between Albania and the Vatican has been renewed today," said the Holy Father, assessing Albania as a country of ancient and glorious history. During this meeting, Pope Francis welcomed the Italian-Albanian community of Arbëreshes and appreciated the climate of mutual respect and trust that exists in Albania, among Catholics, Orthodox and Muslims. "And this religious coexistence is a precious good for the country and for peace," he said among other things.